I originally read this book a few years ago with a book club I used to be in and quite enjoyed it. When the new book club I recently invaded decided to read it I was looking forward to reading it again. And it's a good thing I did since I had somehow confused this book with a fiction book about a poor family of all girls that lived in the English countryside in the early 20th century. Yeah, not sure how I got those two confused and I still haven't been able to remember the name of the other book. But I enjoyed the second reading of The Glass Castle immensely. 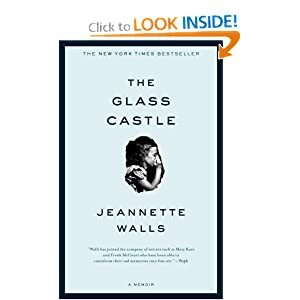 It's told from the point of view of the young daughter of Rex and Rose Mary Walls, Jeannette Walls, as they move from being Southwestern nomads to a depressing West Virginia mining town and as they each are able to find their own way in the world. I can't even begin to sum of the many layers of this book in a short, and completely random, blog post. It's just one of those books that you have to read for yourself. And then read it again. There was really only one thing about this book that I didn't love. Towards the end of the book it refers to the mother putting glass bottles of various colors and shapes in the window for the "stained window effect". Unfortunately, I started doing this a few months back to make our random tiny entry window a little more interesting. I just thought it would look cool. I had no idea I was going for homeless chic. I was going more for hippie witch doctor chic. The bottles will probably have to go now. Was it Capture the Castle that you had it confused with? Love that book! And I think you should keep the stained glass bottles. Homeless chic is so cool! Haha! You didn't tell us this. You were homeless chic before homeless was chic.